I guess I could be placed in the “neat-freak” category. As Alice will explain if you ask her, I have more tolerance for dirt than she does, but I get agitated when something is not put back in its place, even if I am the one that didn’t put it there. One think I’ve noticed when I’m working with others on projects, is if they ask me if I have a specific tool, I can most often tell them how many I have, and pretty much exactly where to find it in my shop. Steve and John are visiting and have been for about 4 days now. They are transitioning from living in a house in Pennsylvania to some travel for about a month, and then an apartment in Chicago after that. Everything they had in Pennsylvania was packed into their two cars. These items are slowly finding their way into the house, and near as I can tell, they are not being organized. I wonder what would happen if I were to take one car’s worth of the most important stuff I have in the house and drove 1,200 miles with it. I think I’d be a little more concerned with getting everything in order, but there are limits to what is possible when there is that much stuff all jumbled together in boxes and bags. Amen to bringing life into the house. Yesterday as we have been doing for most of the last 30 years, we got up and had a bowl of cereal, and headed to the Doelle Senior Center in Tapiola to prepare a holiday meal for any elderly in our community that have no family to share with. This is through the organization called Little Brothers. I’ve mostly worked in the kitchen over the years, as has Steve (he started coming to these events when he was about 2 years old.) Since he has graduated from College, he has made most of the Christmas dinners, but not the Thanksgiving ones for various reasons. This year he was able to make it along with his partner John. 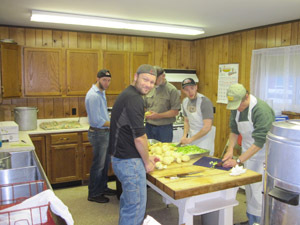 The kitchen help arrives around 9:00 am, and thus starts the well practiced routine. Thanksgiving dinner consisted of turkey, mashed potatoes and homemade gravy, sweet potatoes, homemade dressing, mixed vegetables, salad, and dessert. This year’s event went very well. Some years one thing or another conspires to ruin the whole thing, but this year, everyone was pleasantly busy the whole time, and dinner started precisely on time. There are few things that give me more satisfaction than the quiet that settles over a room with 75+ people in it when all the food is on the tables, and people are eating and enjoying themselves. We kid each other during this event that some of us are getting a little long in the tooth ourselves. 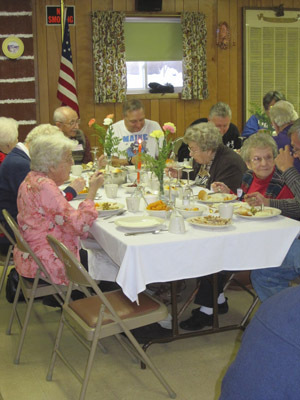 Many of us are qualified by the age requirements to attend the dinners as guests. Until recently, that seemed mostly impossible. For the past few meals, though, and especially this one, we realized that the young people that we’ve been training all these years, are starting to take responsibility for the process. As we’d look around, we’d be thinking, “I think we’d better get this thing going,” except somebody already had. It is comforting to know that should it become necessary for us to retire, that the Tapiola holiday meals would be in good hands. It has been cold and snowy here. We’ve had snow every day for about 3 days now. There are still not adequate snowbanks on the roads to preclude accidents, but they are rapidly evolving into the necessary barriers. 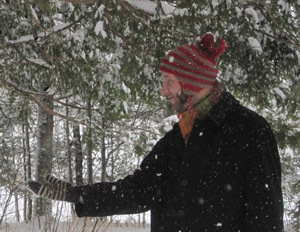 Today when Alice and I walked the neighbor’s dog, we were lucky to have dressed warmly. It was in the teens and very windy. We decided to cut the walk down to 1 mile instead of 2, and neither of the dogs seemed to mind at all. When I came in from that walk, I went to work stoking up the woodstoves, and two things happened. I stoked them a little too much, and it warmed up as the wind died down outside. It got warm enough in here that we considered opening some windows. Our birdfeeders were almost out of sunflower seeds, so I decided to fill them. I told John that I had had some success getting the chickadees to land on my open hand if I remove the feeders and hold some seed in my hand. He said he’d like to try. So we stood out there for several minutes. The birds came very near, as you might be able to see in the picture, but none landed on his hand. He thought it was pretty cool to have them flitting all around him though. A news item from back in September still haunts me. This was about a community in Tennessee that decided to fund their fire department not with property taxes, as it is done virtually everywhere else, but by a special “fee” that property owners were responsible to pay each year. As the story went, if you didn’t pay, you were not entitled to fire protection services in your community. Some poor fellow’s family home caught on fire, and the fire department responded as usual. When they got there, the chief informed the property owner that since he hadn’t paid, they were not willing to help, so they stood around and watched his house burn. They also stayed on the scene because the neighbor had paid, and they were prepared to spring into action in case the fire spread. The property owner offered to pay the chief then and there, but he claimed he was not authorized to accept money. The man’s home burnt to the ground. That story got my attention, and while sifting through my Google News, I came across a video clip of the Glenn Beck radio show where he and his co-host commented on the incident. Glen’s point seemed to be that the fire department acted appropriately, and his co-host repeatedly mocked the property owner’s pleading with the fire chief in a fake accent. Now the world is full of crackpots, and these radio personalities are just two of the many out there. What bothers me is that these guys are *popular. * What is it in our makeup that makes mean-spiritedness so broadly appealing? You’d think all anyone would have to do is watch this sort of thing once, and that would be the last time. Which brings me to the point of this blog. Alice and I had dinner the other night with 3 of our good friends. The topic of conversation was broad and varied, but in most every case, the intent was toward good-heartedness. Would such an interaction make good TV/radio? I wonder. I think we have opportunities in life to reward behavior we find to our liking, especially in a democracy. The last election cycle was telling, in my opinion. We received dozens of full color large post cards and phone calls that contained no discernible information, but rather baseless claims regarding their opponent’s record and/or philosophy. I was hopeful it would backfire, but it didn’t. Are we really so easily fooled by this trickery, or are we in fact mean-spirited and selfish creatures. If the later is true, should we encourage this behavior in each other, or do our best to put it behind us. I think if I would have been a member of that fire department, I would have resigned right then and there. I might also have illegally used department equipment to try to douse the fire. The real culprit seems to me to be the community leaders that implemented such a policy. Taxes are not evil. Taxes are a symbol of our willingness to pool our resources in order to make things better for all of us. Increase your property taxes so that your fire department is properly funded, and make the resource available to everyone that needs it. By forcing an additional fee, households are forced to make a decision, and sometimes we make bad ones. It was an unsurprising November day. I made it out to the woods about 3:00 and it was so overcast that it would have been a bit hard to read out there. I began working on the fir boughs and it started to rain. The dog didn’t seem to notice, and continued to bring his stick hopefully to me as near as he could get it. He still doesn’t understand that these seemingly ordinary tree branches on the ground must not be stepped on with muddy paws. We come to an understanding usually, and sticks get thrown often enough to make the trips out there good ones for him. As I got rained on, I wondered about all the products I consume, and the parts that so many people play in their manufacture, transportation, retailing, etc. The rain did not bother me for a couple of reasons. I was dressed for it, and I could quit whenever I felt like it. I’m guessing that not everyone in the chain of products I consume has either of these luxuries most of the time. It is a nice dream to have… that the world of workers is content with their worklife. Some years ago, I helped start an email list that allows local birders keep in contact with each other. It must have filled a need, because the list has had from 70-100 people on it for years and years. I got a phone call from our neighbor the other day, saying that a mutual friend of ours had a Cattle Egret hanging around his farm. This is very late in the year for any migrating bird to be here, and the Cattle Egret is so rare around here that there are only 7 reported sightings. At least one of our avid birders made the trip out to the farm to see this bird after I posted its location on the birder list. I assumed that would be the end of the story, but the next day I got a call from the fellow whose farm was hosting the egret. He said it had been found in the morning nearly frozen and almost unresponsive. They brought it inside and attempted to feed it, but it didn’t seem interested in food. He asked for my help, so once again I posted to the list to see if anyone had any ideas. The ideas poured in, and one of them told about a couple in Gladstone (near Escanaba; about 140 miles from here) that did bird rescues. I called them and learned they were willing to take the bird, but that they couldn’t come and get it. I posted to the list again to see if anyone might be going down that way and could drop it off. In the meantime, I was expecting the problem to solve itself, because birds that get that cold often don’t survive. Well this guy fooled the critics. He was eating well and once warmed up seemed raring to get back into the sky. We figured we’d better help him out if possible by getting him further south and in the hands of some experts. A couple of possibilities presented themselves, but none that seemed right for this situation. Talking on the phone again with my farmer friend, I learned he was going to Seney on Sunday morning, and could meet someone near Marquette if they could take the bird the rest of the way. I called the folks back in Gladstone, and they gave me the name of a woman near there that does volunteer work for them. I contacted her, and she agreed to meet them Sunday morning for the handoff to the people in Gladstone. I learned several things as a result of this incident. First of all that birders are pretty neat people. Second, that a whole system of bird rescuers exists that I never knew about. And finally, I learned that I’m glad I got involved with this thing. I feel pretty good that this rare (up here) bird will get another shot at life. This morning I started my first fire of the year in our big Jotul stove in the livingroom. Instead of my normal habit of starting the kitchen stove first thing, my plan was to start the Jotul so I could clean the kitchen stove which needs to be done every few weeks during the heating season. I know it is time when it gets cranky and smokes when I engage the damper that routes the smoke around the oven. I packed newspaper, criss-crossed kindling, and some hardwood in the Jotul, lit the match, and then went about my other business. A bit later my eyes were itchy, and when I looked up, there was a layer of smoke all across the downstairs. The Jotul looked like a snoozing dragon with smoke puffing out his cheeks. I quickly stuffed some papers into the cleanout of the chimney and lit them. If the stove is smoking because the chimney is cold, this usually remedies that situation. Well, now I had smoke coming from the Jotul AND the chimney cleanout. In order to look at the stovepipe for the Jotul, I have to slide it away from the chimney, and the thing is heavy. Slide it I did, and surprisingly, I still had smoke coming from only two places. The Jotul was now smoking out the back (it seemed to be burning better now) and the chimney cleanout was still puffing too. I stuck my hand up the thimble hole in the chimney that I recently uncovered by sliding the stove out of the way (you learn how to slide your arm into lots of weird places when you heat with wood) and found a LOT of clinkers up there. Things are getting serious now. I ran out to the garage in my pajamas and slippers and grabbed 3 metal buckets (plastic buckets don’t work well for this.) I then opened the chimney cleanout and started shoveling out clinkers. I also dumped out the pile of them that had accumulated in the Jotul stovepipe. Then I lined the stovepipe back up and slid the stove back into place. By now the fire had gone out. So I opened the door and blew on it to get it going again. I had long ago opened windows and doors downstairs to let the smoke out. My plan to warm the house up with the Jotul stove decreased the temperature by about 10 degrees so far. Some mornings just go like this. Next on my list was the actual cleaning out of the kitchen stove. It involves disassembling a bunch of parts, cleaning out soot, and reassembling. This chore is so familiar that I didn’t have to think about it too much. It is just time consuming and messy. In the end, I had 3 full buckets of either ashes or clinkers to dump in my pile outside. 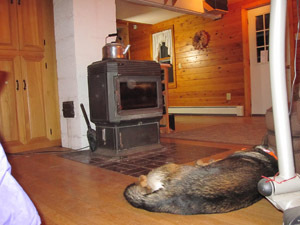 The result is I have two pretty darn clean stoves, one of whose heat the dog is appreciating right now. My other grungy job today was to plug the vents in the crawlspace under the main part of our house with insulation. I unplug them in the spring, and plug them in the fall. This is not a job I look forward to. There is only a few feet of clearance under there and it is dusty and cramped in there. It only takes 5 minutes to get it done, but so far I’ve put it off for weeks. As I walk around the homestead, I see more and more winter projects that are getting checked off the list. They’re never really done until the snow makes it impossible to do any more. Tonight we were eating supper when there was a knock at the door. In the old days we would just get up and answer it. Now we have a fairly loud dog to calm down before we can open the door. Nearly everyone that comes to our door looks kind of concerned when we first open it. Our guest was the same young man that had stopped by last night to ask if he could track the deer on our property that he had shot. We had given him reluctant permission and didn’t think too much more about it. Tonight when I opened the door, he said he just wanted to give us something. It was an envelope and a small plastic container of food. Inside the container were some pretty tasty pickled eggs. Alice and I split one, and then worked on the dishes. I remembered the envelope then, and looked inside. There was a gift certificate for $20 to the Feedmill Cafe in Tapiola! It just goes to show how one can lump a certain kind of person into a group called “hunter,” and then don’t give it much thought anymore. Clearly we made a mistake this time, and probably numerous other times in the past as well. I should have known better, and maybe I will in the future. Hunters are just like any other group. There are a few that ruin it for everyone, but the majority are probably like this young man that just wants to spend some time in our beautiful country. Franco and I did two more bundles of fir this morning, and then spent the afternoon on inside chores. I did hook up the outside antenna for the EnGenius cordless phone I have and tested it out in the woods. The extra range I got from having the antenna hooked up was amazing. That phone is finally doing what I had hoped it would. Since cell service is so spotty out here, I can now carry my cordless phone virtually anywhere on our property and have phone service. There was one drawback, though. While I was working on the fir boughs, I bumped the “redial” button twice and called Alice both times. I’m sure it was an inconvenience for her, but it really screwed me up, because it seemed like I had something heavy in my arms both times that I had to put down and grab my phone as fast as I could to tell her nothing was wrong. I found an option on the phone that allows me to lock the keypad (similar to the lock button on an ipod) so now I can use the phone without worrying about calling someone again. We surely do not appreciate the damage the local deer do to the things we plant and tend around the farm, but we view them like all the wildlife we share this beautiful world with. They are our neighbors. They sometimes do things we don’t like, as we sometimes probably do things they don’t like. For about 2 weeks of every year the neighborhood sees lots of hunters orange and hopeful people and rifles. It is not our favorite time of the year. Franco wears a hunter’s orange collar, and a second orange/reflective bandanna. When we walk at night I keep him in the light of the headlamp as much as possible. It will all be over with on December 1. While we were eating supper tonight a guy stopped by saying he had shot a deer and wondered if he could track it on our property. I hemmed and hawed, and said ok. It turned out he was the son of one of our neighbors that comes up every year for this event. I took my regular trip to town today for errands. Lots of stops were made. One of them was at the Verizon store, where I asked for the opportunity to play with the Samsung Galaxy Tab. That little machine has the best screen I’ve ever seen on any computer. If you like to watch movies and TV away from home, this may be the device for you. It has a built in GPS too, but it costs $10/month for some reason. I brought along a SD micro card and loaded a couple of ebooks on it. I think the screen is very readable for text, although I don’t know how the eyes would feel after several hours. It costs a minimum of $20/month for 3G service, and it can not be used as a phone, although the web said the European model has phone capability. It is a sweet machine. I also delivered 12 more bundles of fir. I saw some of the boughs they have made so far, and they look typically beautiful. If you want inexpensive and beautiful balsam fir christmas wreaths for yourself or gifts, you can’t go wrong at the Einerlei in Chassell. Today I drove up to Calumet and met with my friend Ken Olkonen about the possibility of getting a PV solar installation done at our home by the end of this year in order to take advantage of the tax credit. He was not too encouraging, but did think that if I could buy the materials and get everything installed except the final electrical hookup that they could do the hookup. That was my plan all along anyway. Now I need to get a system figured out and see if what I need is in stock and available for shipment. Why do I wait until the last minute? Franco and I had another nice walk after supper. It was very dark and snowing, and the snowflakes in the headlamp put on a pretty show. If you’ve never experienced it, you’re in for a treat. A lot depends on the wind direction and the size of the flakes. The best way I can describe it is sparks going off a few inches from your eyes. Franco looked at me like I was nuts when I’d just stand there and look up at the sky. Of course, he always looks at me like I’m nuts unless I’m throwing his stick for him. Saturday and we slept in… ah! It was snowing when we got up and did so most of the day. It was imperceptible to me, but at some point in the afternoon the snow did stop and the rain took over. Franco and I were out making fir bundles for a bit over an hour. By then my hands were getting cold and my pants were wet (I know what you’re thinking.) This is more like the November fir bough making weather I’ve cherished. Halfway home I’d made up my mind a cup of hot chocolate was in my future. Nothing seems to take the chill off for me like hot chocolate. Franco and I did only a mile after supper. It was windy and rainy. I got interested in watching the raindrops in my headlamp, especially when I was walking into the wind. Seeing those water droplets suddenly illuminate and smack into your glasses is mesmerizing. This time I didn’t need hot chocolate when we came in, even though my pants were wet once again. You are currently browsing the Rural Life in the UP of Michigan blog archives for November, 2010.